Thunderkick is taking players to the jungles of central America for its brand-new slot, Jungle Temple which has been released exclusive early. Based on the lost Mayan civilisation, it’s a 5 reel, 20 payline game that comes with the developer’s usual high-end design and silky-smooth gameplay. As you’d expect from for a Thunderkick slot, the design in Jaguar Temple is very nicely done. With the ruins of a stone temple building in the background, you’ll see primitive icons featuring birds, rabbits, dogs and fish spinning around the reels. The jaguar icon is the top payer, awarding payouts of up to 50 times your total stake per payline. The jaguar can also appear in giant 3×3 blocks which can certainly help your winning chances. The best chances of landing some Mayan treasure come via the Bonus Game feature – landing 3, 4 or 5 of the bonus symbol will get you 10, 15 or 20 free spins. Boosting your winning chances here are wilds that expand to fill the whole of the reel whenever they hit. Expect to see the colossal 3×3 jaguar symbols roar into view far more regularly in the feature than in the base game. Re-triggers are possible here too. Land just 2 scatters and you’ll get another 3 free spins. Hit 3, 4 or 5 and the usual allocation of 10, 15 or 20 extra free spins are on offer. It might not be quite as outrageously themed as many Thunderkick slots (yes, we’re looking at you Birds on a Wire and Barber Shop Uncut). The colourful visuals are as high end as we’ve come to expect and the gameplay gallops along. It also offers wins of up to 2,045 times your stake on every spin! 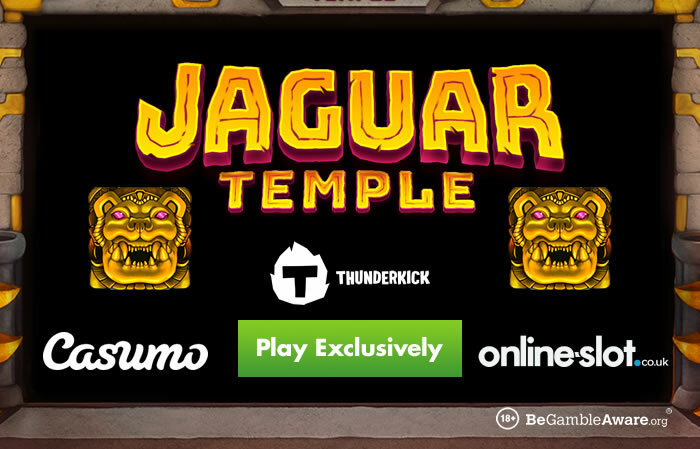 If you’ve enjoyed other Thunderkick slots, then you’ll find plenty to like in Jaguar Temple. Take it for a spin today only at Casumo Casino – they will be the only online casino to have Jaguar Temple until it’s general release on the 19th of September (2018). Register an account to be rewarded with 20 no deposit free spins on NetEnt’s Starburst as well as a 100% first deposit bonus offer up to £300.